Don't let the size fool you. The Go Mic is an impressive cardioid mic with great features, including zero-latency monitoring. I’ve been hosting a podcast for over a decade, and currently use the Audio-Technica AT2020 as my primary microphone. Since the majority of Stimulated Boredom episodes are usually me hosting solo, the AT2020 has been a perfect mic for capturing a natural and professional sound. Having guests call in and remotely join the program is also not a problem. However, if I ever need to conduct a face-to-face interview, it can become a little more problematic, as the AT2020 is unidirectional, meaning it only picks up voices directed towards the front of the mic. 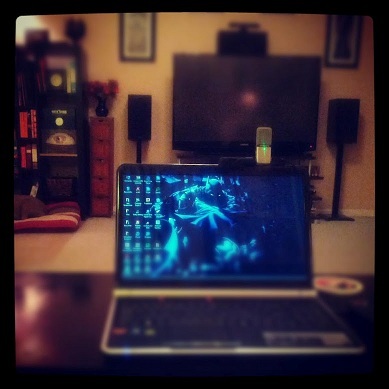 A proper set-up, one that is intended for multiple in-person guests and interviews, usually requires a mixer and multiple XLR mics, which can be expensive. Enter the “Go Mic” by Samson. I also own the Samson C01U and had previously used the Zoom H4N, and have been pleased with the quality of Samson products, so I knew I was getting a decent microphone. However, this microphone did exceed my expectations. The first thing you’ll notice about this mic is just how small it is. The mic comes neatly folded inside of a well-built and solid metal clamp that can be used to clip it to the monitor of your laptop (it will not clamp to most desktop monitors) and has a nice balanced weight to it. It can also be mounted to a standard mic stand or boom. However, don’t let its diminutive size fool you, as it is an impressive cardioid mic with three built-in settings: Uni-Directional, Omni-Directional or -10 dB pad, including latency-free monitoring, which is a nice feature to have for such a low cost. You would use the unidirectional setting when it is just you, and you don’t want the mic picking up any sounds to the left, right or behind the mic. This is the most common setting that would be used by solo podcasters, as it isolates their voice as the primary source. It is also the ideal setting for vastly improving the audio quality of video recordings or Skype calls, over that of your computer or camera’s internal built-in mic. Omni-directional will pick up a 360 sound pattern and is perfect for when you are interviewing people sitting across from you or around the table, to pick up everyone who is talking. The -10 dB pad (in which it automatically lowers the mic’s sensitivity) is for when you need to get up close to the mic for voice-overs, narration or any other application in which you need to cancel out ambient noise. The negative DB pad helps to eliminate surrounding sound and isolates your voice but does require you to be much closer to the mic for it to pick you up as the primary source. I went ahead and threw together a quick overview/review video. Unfortunately, the audio ended up being heavily compressed during the video upload to YouTube and is not a truly accurate representation of the Go Mic audio quality. I tested all of the settings and was very impressed. Unidirectional picked me up very clearly and, although it certainly won’t replace my AT2020 as my primary mic, it did a VERY respectable job and would be an excellent solution for when I have to podcast on the road, am doing a face-to-face on-location interview or can’t be in my home studio. The Omni-directional setting picked up both sides of the conversation clearly and really “opened up” the room, creating a nice organic and informal vibe to the conversation, which I like. However, those interested in the “Go Mic” for this particular setting should know that it will pick up a lot of ambient noise and sound more hollow than rich. Therefore, if you are near an AC vent, a barking dog, a loud ceiling fan or other people who are moving about the room, this setting will pick much of that up. So, if you are planning to start a podcast with multiple co-hosts, you may want to invest in a mixer and XLR microphone set-up, to capture cleaner and more direct audio from all speakers. The -10 dB pad setting was also stable, as I sat within 6 inches of it (using a pop filter) and it did an excellent job of eliminating any surrounding noise and only capturing my voice cleanly, which is excellent for tutorials, narrations, and voice-overs. You can also make adjustments to the gain, which will affect its sensitivity to your liking. I use Audacity as my DAW. Lastly, the “Go Mic” allows for latency-free monitoring. For those unfamiliar, this will enable you to plug a pair of headphones directly into the microphone and monitor your recording in real-time. For some, hearing themselves through headphones while they are talking can be distracting; for others, it is a way to keep tabs on how they sound and allowing for adjustments to be made in levels or position to the mic during the recording. I tested this feature and experienced zero latency while recording and it is a nice feature that is included. Obviously the environment in which you record is going to play a significant role, therefore you should know that I intentionally recorded in a room in which I expected there to be some “color” due to our voices bouncing off of the walls…as this would be the likely environment that I would be in if I were doing a remote face-to-face interview. There was no distracting sense of echo, but as I stated previously, the omnidirectional setting does open up the room to a 360-degree pattern, which allows for the mic to pick up everything in that room (in my case, it was our dogs playing). Also, I tested it as a replacement for the built-in mic on my laptop, and it blew its doors off! I recorded two videos using the Go Mic and the internal mic, and the difference is absolutely night and day. The Go Mic was exceptionally clear, whereas the built-in mic could sound muddy by comparison. If you record web videos or do a lot of online conferencing, you will love the way this mic sounds compared to your internal or built-in mic. As I mentioned previously, this mic is intended to be clipped to a laptop screen and will not attach to most desktop monitors. However, thanks to its durable metal base, you can place the mic on a desk or table, and remember to angle the mic towards you. Also, I did not have any issue with the mic picking up too much computer fan noise while attached to my laptop. You will hear some – mostly in omnidirectional mode, not so much in unidirectional – but it was not anything that would distract from the recording or conversation. Another nice feature is how the power indicator light also doubles as a sound monitor, in that it will blink if your levels are spiking. This feature is especially useful if you do not plan to monitor your recordings with a pair of headphones. For the current price (sub-$40), and if you’re looking for a portable budget mic, you ABSOLUTELY should be considering this microphone. 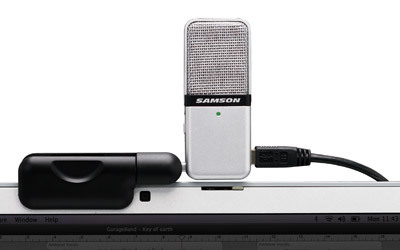 Its portability and sound quality make it ideal for so many different voice-recording applications. And the bevy of functional settings makes it a no-brainer. Not to mention the fact that it folds up nicely, feels solid, fits in your palm and comes with a durable storage case, USB cord and the ability to mount it to a mic stand if need be. I wouldn’t recommend it as a primary mic for podcasting; for that, you should be willing to invest more ($100+) to improve the quality of your show. 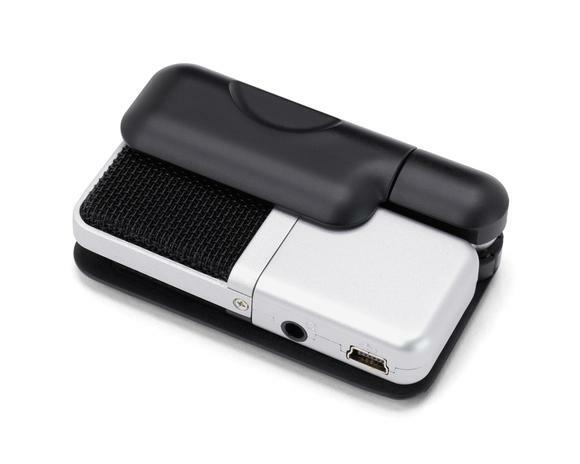 But as a compact and portable solution for on-location recordings, video conferencing, online gaming, web videos or for the occasional interview/guest, it is a recommendation that I am happy to make. 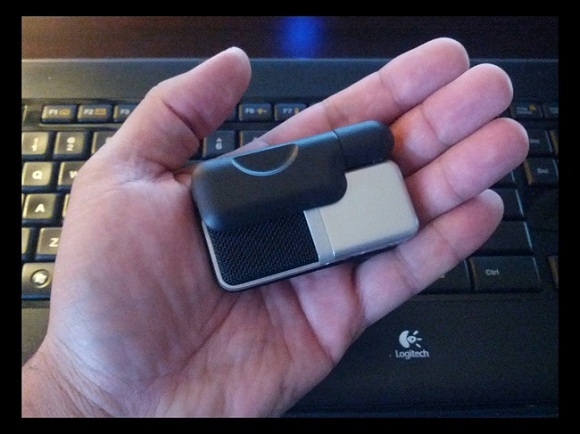 For a compact and portable solution for on-location recordings, video conferencing, online gaming, web videos or the occasional interview/guest, the Samson Go Mic is a recommendation that I am happy to make.